An interesting and unexpected source of infrared photographs from the 1930s is the American Colony in Jerusalem, later the Matson Photo Service. According to the Library of Congress, where the collection [infrared photographs | whole collection] is now kept, the colony was “an independent, utopian, Christian sect formed by religious pilgrims who emigrated to Jerusalem from the United States and Sweden. The history of the Colony is intimately linked to the photography collection it spawned.” Eric and Edith Matson continued the photographic work in the middle-East and around east Africa after the colony broke up in 1934. They were innovative photographers working with infrared, colour, 3D and aerial photography although most of the collection is conventional. 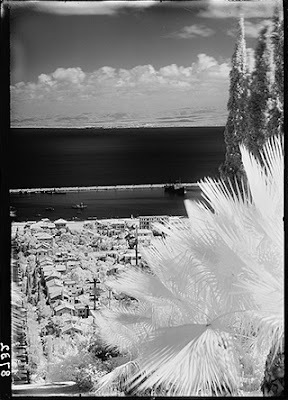 This is one of the infrared plates in the collection, entitled Haifa, looking across the bay from Carmel showing harbour & Acre beyond. It's a 5 by 7 inch dry glass plate, which begs the question of where this was sourced. Given the climate in what is now Israel my guess is that the plate was sensitised locally. More detailed information on the colony and the collection can be found on this LOC page. There are thousands of fascinating images in the whole collection and many of them can be seen online. You can find a few more infrared photos by searching using infra-red but this also hits a lot of false drops since the term appears in a general descriptive field (hover over the thumbnails of the first few photos to check titles for the word infra-red). I should also add that there are photos taken around Africa as well as in what is now Israel. If you fancy a 2013 calendar of infrared photographs ... and sorry but I don't do one .. you should look at a collection of superb infrared photos in the latest edition from Simon Marsden's archive. Available from the Marsden web site. Even if you don't fancy the calendar you should look at the photos: all taken on Kodak HIE from Simon's private refrigerated stash.